HPGDS antibody LS-C17379 is an unconjugated rabbit polyclonal antibody to HPGDS from human and mouse. Validated for IHC and WB. HPGDS antibody was raised against recombinant human hematopoietic prostaglandin D synthase (H-PGDS). Recognizes human H-PGDS. Species cross-reactivity: mouse. 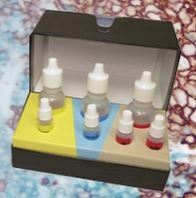 Suitable for use in Immunohistochemistry and Western Blot. Immunohistochemistry: 1:1000. Western Blot: 1:200 with 1 hour incubation at RT. (1:500 dilution with overnight incubation at 4?C also produces optimal results. ).